I readily admit that I am not much of a birder. Until a few years ago I photographed mammals and large mammals at that. This began to change about three years ago when I first visited Chincoteague National Wildlife Refuge. I began to photograph the big birds and enjoyed this location very much. I slowly learned how to identify the bigger birds and even picked up a “Pocket Naturalist Guide” to help me in this endeavor. I learned the subtle differences between the Great Egret and the Snowy Egret. Slowly but surely I was learning more and more about birds. This week I returned to Chincoteague. The trip began like many previous ones–photographing a few Great Blue Herons, a Great Egret, and several ducks. I even learned to distinguish the differences between the Mallard and the Northern Shoveler. Then something unusual and exciting happened–I spotted an unusual and interesting bird that I had never seen before. It behaved in an unusual manner as it pointed its head to the sky and moved in a strange gyration that resembled the weeds blowing in the wind. I took a few photos and it was gone. Later in the day I happened upon this bird again. Two men approached me and asked what I had seen. I tried to describe this particular bird and then showed them an image of it from my camera’s LCD screen. 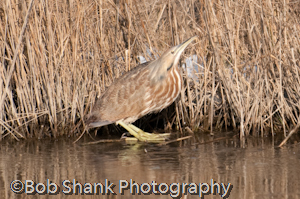 They excited and enthusiastically informed me that I had spotted an American Bittern! We found this bird again and took some more photographs. I still am not much of a birder. 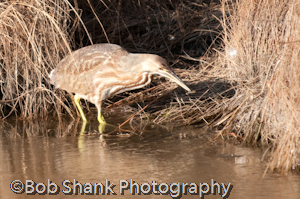 I know, for example, that without the help of these two nice men I would have had a hard time identifying this bird. I might still not known what I had seen. But I am learning and growing to like birds more and more. 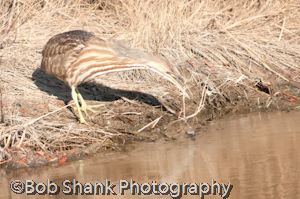 Here are a few images of the American Bittern I saw this week.